Give your casual wardrobe a stylish lift with this top from Marie Claire. Fashioned using viscose jersey fabric, this 3/4th sleeves top will not fail to catch your fancy at a single glance. Featuring a V- neck and slub pattern, this top holds an elegant appeal. Floral and feminine, top perfects the art of chic dressing. 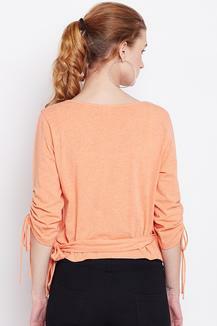 Style this top with a pair of jeans or shorts and casual shoes.